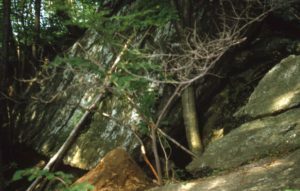 Binette Site: An unusual rock shelter in Naugatuck, the Binette site was one of Connecticut’s first “motels”. Binette is a good example of human use of natural features for short-term housing. 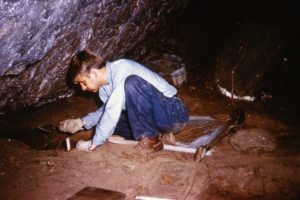 Excavated by the Greater New Haven Archaeological Society under the direction of professional archaeologist David H. Thompson, Binette was used to harbor travelers from Paleo-Indian hunters ca. 10,000 years ago to English surveyors in the 18th century. Native American artifacts from Binette include a Paleo-Indian fluted point, Late Archaic Vosburg point, Late Woodland Levanna point, and Contact period Shantok-like pottery. 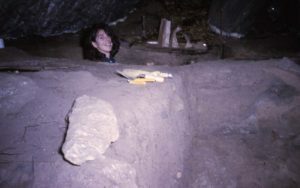 They show that peoples from earliest human settlement through the post-contact period continued to use the shelter as a temporary refuge against the natural elements. Colonial artifacts from the Binette site included kaolin clay pipe fragments. View of Binette rock shelter archaeological site. 1969 The Binette Site, Naugatuck, Connecticut. Eastern States Archaeological Federation Bulletin 27/28:14-15.